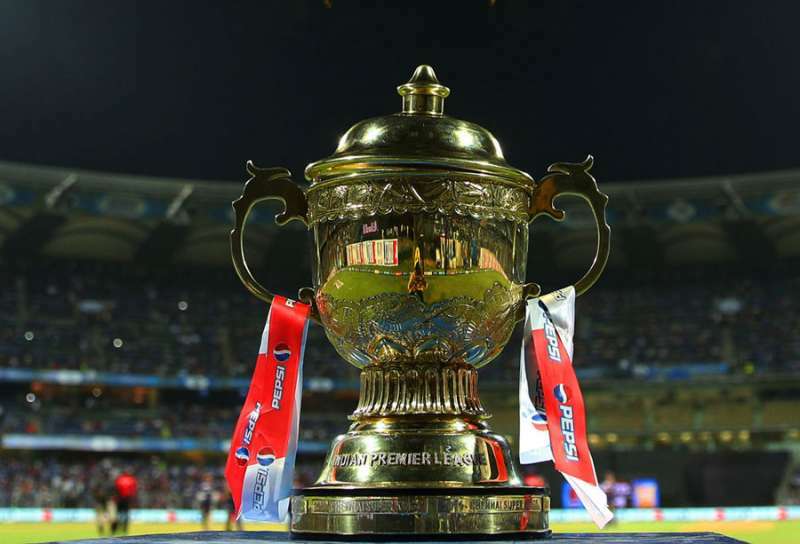 Today saw the auction for the 2017 edition of the Indian Premier League (IPL) and it came with the usual fanfare. We saw two English players in great demand, a couple of potential bargains and some rather questionable purchases. On the flip side, there were players that one might have expected to be signed that were overlooked, some correctly and some could have provided good value to franchises. This article will look at a selection of players and look to classify them in terms of whether they were smart signings or not, or whether they should have been signed or not. To achieve this, I will be using the ratings generated by my T20 model. I will not go into too much detail as to how it works in this article, but further information can be found by following the links at the bottom of the page. His performances in the last month in both the international matches against India and the Pakistan Super League have actually boosted his death rating further to 1.20, securing his spot as the top death bowler in T20 cricket. At 12 crore, it might be thought that he is expensive, but I would class this as a very good signing by Royal Challengers Bangalore, although it will be interesting to see how he deals bowling many of his overs at the very bowler-unfriendly ground in Bangalore. 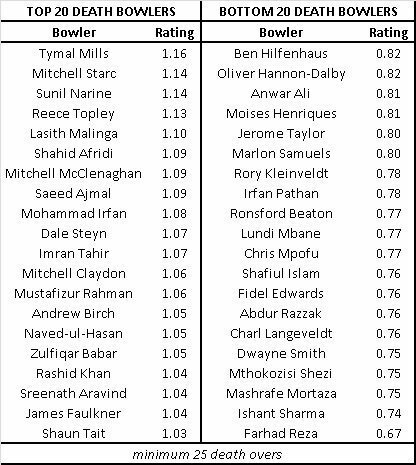 Kagiso Rabada is a bowler that did not appear on the previous death bowling table due to inadequate overs, but a death bowling rating of 1.12 shows that he is another very good bowler in one of the most important periods of the innings. A rating of 1.10 in the powerplay overs also show that he is a real threat throughout the innings and he could be a very smart signing for the Delhi Daredevils. 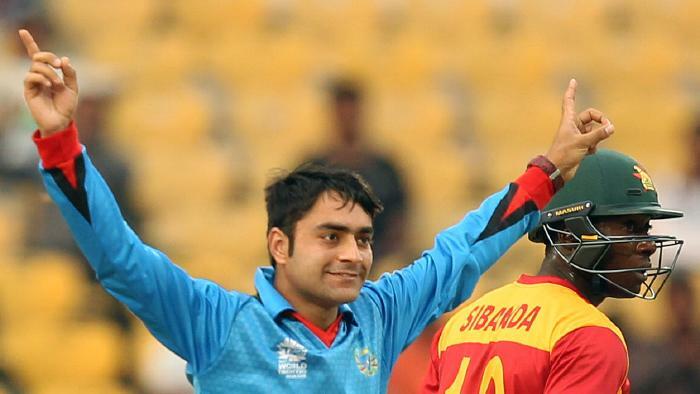 Rashid Khan is a name that may well be unknown to many, but he was one of the surprise signings of auction day after being signed by Sunrisers Hyderabad for 4 crore. The 18-year old Afghan could turn out to be an inspired signing though. A middle overs rating of 1.16 is excellent and he is both economical and a wicket-taker during this period, while he has also been used in the death overs at times and has returned an excellent 1.16 rating. 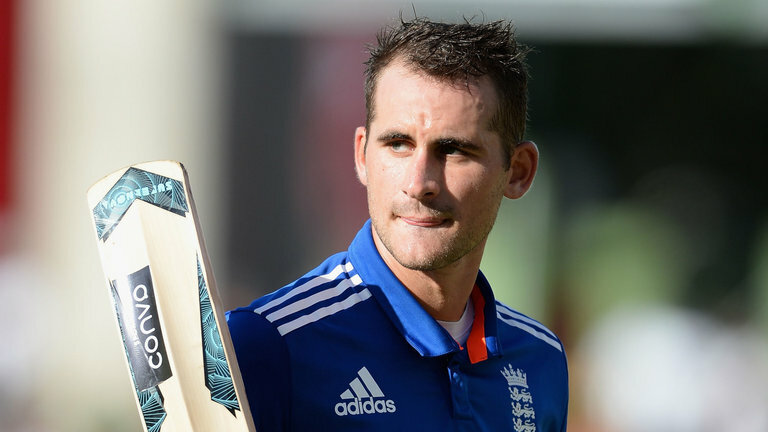 How much he will be used by Sunrisers Hyderabad remains to be seen, but he looks a smart signing. Jason Roy and Martin Guptill are both smart signings as opening batsmen with batting ratings of 1.26 and 1.18 respectively. Gujarat already have Brendon McCullum, Aaron Finch and Suresh Raina, but the addition of Jason Roy gives them a very dangerous top 4 if they choose to play all of those players and alongside McCullum, they have two of the fastest starting opening batsmen in this format of the game. Nathan Coulter-Nile was picked up by the Kolkata Knight Riders, but it is tough to see the logic behind this signing. He is a good powerplay bowler with a rating of 1.12, but this drops to 0.98 during the middle overs and 0.90 during the death overs, which combined with a batting rating of 0.72, means that he is only really a feasible option if you bowl three of his overs during the powerplay. Corey Anderson is another all-rounder that is a strange signing. A batting rating of 1.03, a powerplay bowling rating of 1.02, middle overs rating of 0.78 and a death rating of 0.85 really means that he does not really excel anywhere. There is a group of all-rounders that seem to be picked up regularly, despite not really being good enough at either batting or bowling to fully justify their place - Anderson is joined in this group by the likes of Darren Sammy and Dan Christian. This may be a slightly controversial view, but I would class Ben Stokes as a poor signing, particularly given the money that was spent on him. His bowling ratings are 0.72 in the powerplay, 0.83 in the middle overs and 1.00 in the death overs, none of which are really anything to write home about. His batting rating of 1.05 is fine, but nothing more than that, so while he is not a terrible option, there is little to justify his billing as the most expensive foreign player in IPL history. While there are plenty of good opening batsmen already signed in the IPL, the quartet of Alex Hales (1.24), Michael Klinger (1.19), Evin Lewis (1.12) and Mohammad Shahzad (1.08) might all feel slightly unfortunate to have been overlooked. However, one batsman that has been rightfully overlooked after many years of playing in the IPL is Ross Taylor, whose batting rating of 0.97 is just not good enough to justify a place in the elite competition. Two all-rounders that were surprisingly, but correctly, overlooked were Irfan Pathan and Thisara Perera. Two players that have played in the IPL for many years, they have been living on their past reputations and potentially undeserved reputations as dangerous big hitters, but their stats do not really show anything to suggest that they would add to any of the current IPL franchises. 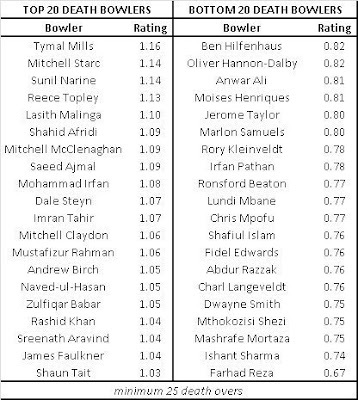 Moving onto the bowlers, there was surprise at the fact that Imran Tahir was overlooked. He only really bowls in the middle overs and a rating of 1.02 for that period suggests that he is a decent bowling option, but no more than that. 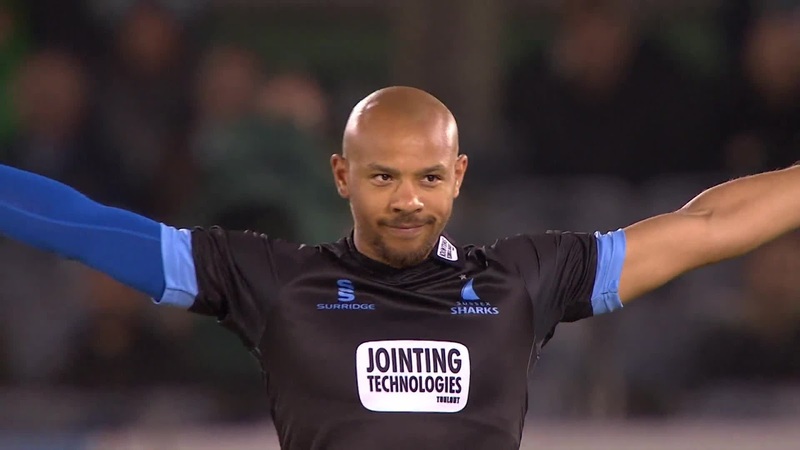 He may have been unfortunate to be overlooked, but it is not necessarily the biggest oversight. Ishant Sharma is one of the worst death bowlers in T20 cricket and it is smart by franchises to overlook him. He is not good enough in the powerplay to justify picking him and bowling him through the powerplay, so there is not a role for him in a good T20 team. One player that can feel aggrieved to have missed out is New Zealand's Ish Sodhi. A rating of 1.30 in the middle overs is genuinely world-class and on potentially spin-friendly wickets in India, he could have been a big player at potentially a low price. Excellent insight. Thank you. Would love to see more such articles prior to or during the tournament. Regardless of whether it be a marked notice or a totally unforeseen extravagance thing you are probably going to chance upon some exceedingly attractive and profitable parcels on offer.